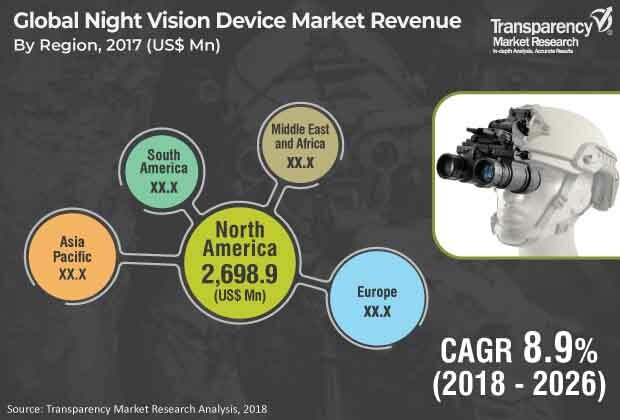 According to a new market research report published by Transparency Market Research, the night vision device market is expected to reach US$ 14,861.2 Mn by 2026, expanding at a CAGR of 8.9% from 2018 to 2026. According to the report, the global night vision device market is likely to continue to be influenced by a range of macroeconomic and market-specific factors in the next few years. In terms of demand, North America is projected to lead the global market during the forecast period. The market in the region is likely to expand at a CAGR of 9.3% from 2018 to 2026. China, India, Japan, and South Korea are expected to be major contributors to the night vision device market in Asia Pacific during the forecast period. In different countries across the world, government organizations are upgrading their existing weapons and devices in order to enhance navigation and targeting and surveillance capabilities of the military. Increasing terror threats in different countries is expected to be a major factor boosting the global night vision device market during the forecast period. Increasing demand for automotive night vision devices for use in high-end commercial cars is fueling the market for night vision devices. It is also expected to create better opportunities for manufacturers of night vision devices in the next few years. Moreover, the night vision technology have become an important topic for scientists to conduct research on. Furthermore, rising need of the modern armies to operate at night and during conditions with poor visibility has led to significant advancements in the technology of night vision devices. With the increased spending by governments on NVDs to fulfill the demand for combat operations and night patrolling, the global night vision device market is expected to witness significant growth during the forecast period. This is expected to propel the demand for night vision devices in the next few years. The global night vision device market has been broadly segmented in terms of type, technology, application, and geography. Based on type, the market has been segregated into vehicle use and personal use. The personal use segment has been sub-segmented into scopes, googles (bi-ocular & monocular), cameras, and others. Among types, the personal use segment accounted for a major share of more than 80.0%, in terms of revenue and volume, in 2017. In terms of revenue, the personal use segment is anticipated to expand at a CAGR of 9.6% during the forecast period. In order to fulfill the global demand, various manufacturers of night vision devices are currently focusing on research and development activities on a regular basis in order to invent advanced applications of night vision devices. Developing infrastructure, economic growth, large population, and increasing urbanization are expected to drive the night vision device market during the forecast period. Military & defense is a leading sector driving advancements in the night vision technology. On the other hand, as applications in commercial markets continue to advance, the demand is estimated to increase further in the near future. Based on technology, the night vision device market has been divided into image intensifiers, thermal imaging, and others. The image intensifiers segment held the maximum market share in 2017, in terms of both revenue and volume. Additionally, it is a highly attractive segment of the global night vision device market. It is expected to register the maximum growth rate of 9.4% during the forecast period. Growing concerns about the national security, lower prices of devices than thermal imaging devices, and rising adoption of night vision devices from the military & defense sector are fueling the night vision device market. In terms of application, the night vision device market has been classified into military & defense, law enforcement, hunting, wildlife observation, surveillance & security, navigation, and others. Military & defense is a highly attractive application segment of the global night vision device market. In terms of revenue, the segment is expected to expand at a CAGR of 9.4% during the forecast period. The increasing need of the modern armies to operate at night and during conditions with poor visibility has led to significant advancements in the technology of night vision devices. With the increased spending by governments on NVDs to meet the demand for combat operations and night patrolling, the global night vision device market is expected to witness significant growth during the forecast period. As per TMR analysis, in 2017, North America accounted for the maximum i.e. more than 35% share of the global market, in terms of both revenue and volume. The Asia Pacific night vision device market is primarily driven by increased investments in modernization of military infrastructure and risen urban population in the region, especially in developing economies such as China and India. The night vision device market is expected to witness further innovations and developments in the near future, as several leading manufacturers are investing in research and development activities. The research study includes profiles of leading companies operating in the global night vision device market. Market players have been profiled in terms of attributes such as company overview, financial overview, business strategies, and recent developments. Some of the key players operating in the global night vision device market are Armasight, ATN Corporation, BAE Systems, FLIR Systems, Inc., Harris Corporation, L-3 Communications, Meopta, Newcon Optik, Optix, Sofradir EC, and Thales Group. Various business strategies are being adopted by market leaders. Companies are focusing on expanding their business by entering into strategic partnerships and offering innovative solutions.